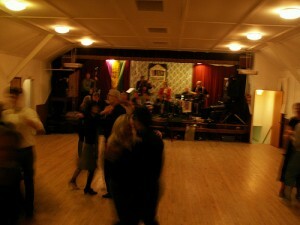 The dance is at the usual location, at the Irish American Heritage Center at 4626 N. Knox in Chicago, IL. Dance instruction is offered from 5:15 to 6:00 pm, followed by the actual dance from 6:00 to 9:00 pm (Chicago time, of course). Admission is $12. For more info call 630-833-3515 or email info@midwayramblers.com. Well, 18 folks paid to get in to the Louisiana Dance Party on November 19 at the Pittsfield Grange, so I covered the hall rent, although it didn’t fully cover the cost of refreshments. Quel dommage! It seems most folks had fun dancing, though. Cyndy Cleveland was kind enough to drop by and give some basic Cajun two-step and waltz dance lessons, and we even had special guests Chuck and Lorraine (formerly of Chuck’s on the Boulevard) drop by to say hi. Even better, and unexpectedly, Chuck and Lorraine brought a pot of jambalaya to share with everyone! Lagniappe! I had promised cake in celebration of 10 years of Maison Bleue being together as a band, and it was a very nice marble cake from Heritage Bakery of Livonia, MI. We also had ice cream, and had a toast of 10 years down, and many more to come. Oh, yeah, did I mention Chuck and Lorraine’s delicious jambalaya? I should probably plug their excellent cookbook, n’est-pas!? 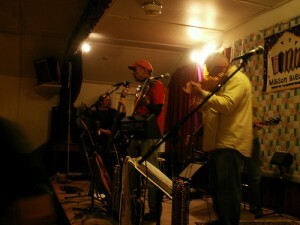 After the intermission, we let Jeff Boerger’s “other” band, Cracklin’, take over on stage. 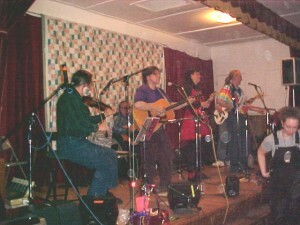 Jeff plays guitar and fiddle in Maison Bleue, he also plays those and accordion in Cracklin’. Of course. with Cracklin’ playing the music, some members of Maison Bleue (and Cyndy) were able to “get down” with playing Maison Bleue’s extra “noise-maker” instruments. All in all, it was a fun time. 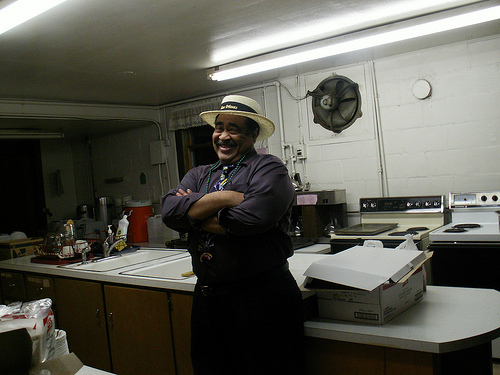 Although it is a lot of work putting on a dance at the Grange, it was nice to see several faces of folks who used to come to the Louisiana Dance Parties when we held them monthly in the early 2000s. A few of those folks admitted they missed the regular dances, so I said I will try to have them annually, perhaps every November. Return of the Louisiana Dance Party, November 19! Aiyeeeeeeee! A few folks may remember when Maison Bleue played for a monthly “Louisiana Dance Party” at the Pittsfield Union Grange Hall just south of Ann Arbor, Michigan, in the early 2000s. 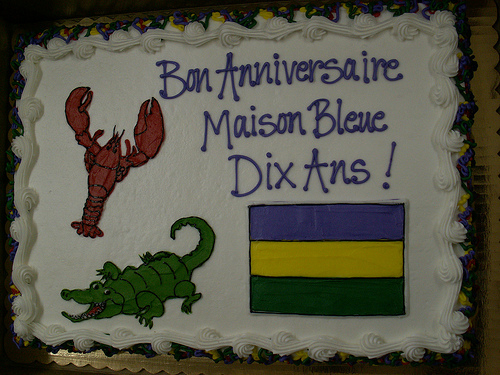 Well, in honor of the fact that Maison Bleue played their first Cajun/zydeco dance at the Grange in November of 2000, they deemed it necessary to celebrate that 10th anniversary with another Louisiana Dance Party! 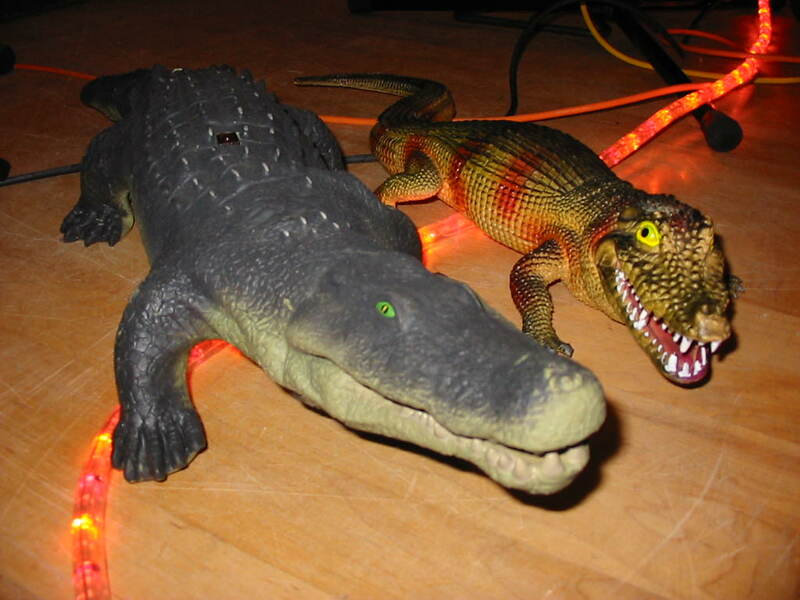 Pet Maison Bleue's pet 'gators! To celebrate the 10 years of being together as a band, Maison Bleue is charging admission based on the prices from 2000. They are $6 for adults (20 years and older), $3 for teens (ages 13 to 19), and kids 12 and younger are free when accompanied by an adult. Please bring clean soft-soled shoes to change into for dancing to help protect the nice wooden dance floor from grit that gets tracked in with street shoes. Wear loose, comfortable clothing, and prepare to have fun! Posted in Dance, Music | Comments Off on Return of the Louisiana Dance Party, November 19! Does anyone remember the Frog Island Music Festivals that used to happen in Frog Island park in Ypsilanti, Michigan? Does anyone remember Queen Ida? 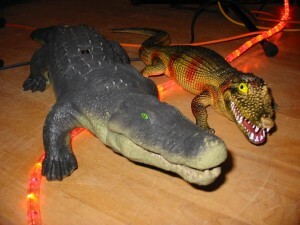 Well, if you do, there’s an event this Friday, November 13, that’s right up your bayou! 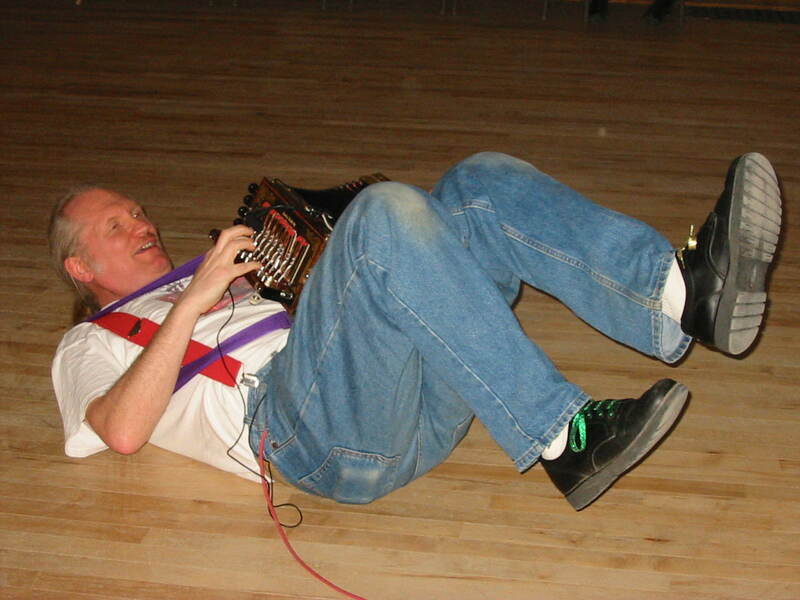 The Ark in Ann Arbor, MI, is having a “Frog Island Festival Revival” featuring Myrick “Freeze” Guillory, and Myrick just happens to be the son of famous zydeco accordionist Queen Ida, so he learned his craft from a master of the zydeco craft. Also appearing is former local Ann Arbor bluesman Al Hill, who has now relocated to Nashville. This event is a fundraiser for The Ark, and tickets are priced accordingly: $500, $250, $125, and $45. The Ark also suggests you wear your vintage Frog Island T-shirt (if you have one). For more info, call The Ark at 734-761-1800 (days) or 734-761-1818 (evenings). The Ark is located in downtown Ann Arbor at 316 S. Main St.
Perhaps you’re somewhere near Toronto, Ontario, this coming Saturday night, November 13. Why not go and check out Swamperella at the Silver Dollar Room? 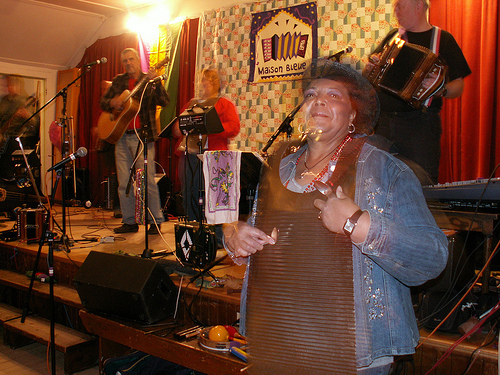 Swamperella plays solid traditional Cajun music, primarily from the fiddle of Soozi Schlanger and the squeezebox of Peter Jellard. They play starting at 7:00 pm, and the Silver Dollar is at 486 Spadina Ave. in Toronto. There is a $10 cover. Y’all have heard of “the announcer’s jinx”? You know, when a sports announcer on radio or TV says something along the lines of “this kicker has been perfect on extra points this season” then immediately afterwards the kicker will shank an extra point so he’s not perfect any more? I feel like I recently made a “blogger’s jinx” when I blogged about the First Friday dances in Chicago with the Midway Ramblers. 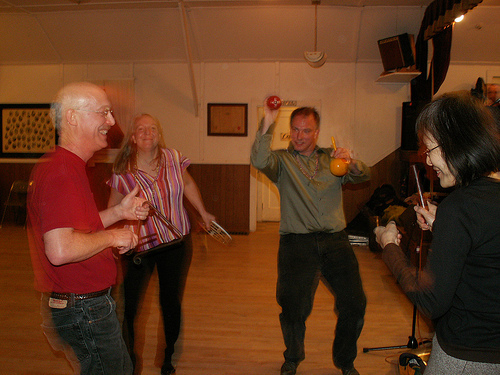 The Ramblers have a dance this Friday, November 5, then a dance on Sunday, December 5 (with Morris Ardoin), and then will not have any more regular dances (at least for a while). I know that many of you started your “careers” in Cajun with our dances and that some of you go at least as far back in decades as we do with our love of Cajun dance music. I thank you all for attending our dances over the last ten years. We certainly grew as a band and many of you made new friends. We hope to see you on November 5th for the regular dance and on December 5th for the wonderful Morris Ardoin Creole Quartet. Quel dommage! But I understand how hard it is to manage a regular monthly dance, and I can also understand why the Ramblers might feel they need to take a break from those dances for a while. So, if you can possibly make it to the November 5 or December 5 dances, do so! As a reminder, the November 5th dance is at the Irish American Heritage Center, 4626 N. Knox (at Wilson), Chicago, IL. The dance is in the Shanachie Room and starts at 8:00 pm, some dance instruction is given around 8:45 pm. Admission is $8. Info: 630-833-3515.